...To explain these results, we offer evidence for a new theory involving the historical persistence of political and racial attitudes. Following the Civil War, Southern whites faced political and economic incentives to reinforce existing racist norms and institutions to maintain control over the newly free African-American population. This amplifed local differences in racially conservative political attitudes, which in turn have been passed down locally across generations. 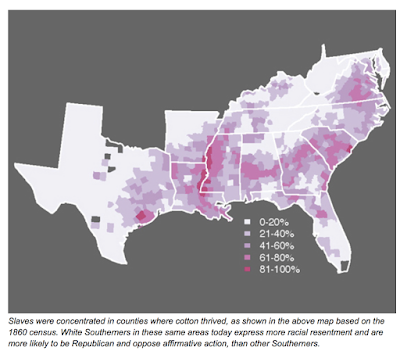 Our results challenge the interpretation of a vast literature on racial attitudes in the American South. The years during and after the Reconstruction period saw whites coordinating to provide an informal social infrastructure (and to the extent legally permissible an institutional one as well) to maintain as much as possible the economic and political power previously guaranteed to them under slavery. decreased wealth concentrated in black farms in the decades after Reconstruction. We also showed that the long-term effects of slavery are smaller in areas of the U.S. South that were quick to mechanize in the early to mid-20th century. Finally, we also offered evidence that parent-to-child transmission could be an important mechanism by which attitudes have been passed down over time. However, we do not rule out that Southern institutions may have also played an important role. And as we saw, slavery was a huge source of wealth to slave holders. Areas of the South that were less dependent on cotton had lower rates of racial antagonism and white resentment. But I think the authors of the Political Legacy paper missed another reason for the antagonism - the former slaves wanted - nay expected - restitution. We'll talk about that next.